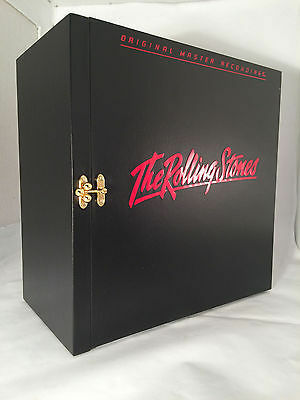 ROLLING STONES Original Master Recordings: The Legendary & extremely rare 1984 US limited edition individually numbered Mobile Fidelity embossed, hinged wooden box set containing ELEVEN MFSL audiophile 180gram virgin vinyl LPs, an exclusive 32-page book containing the full size original sleeve artwork (including the lenticular 3-D 'Satanic Majesties' cover) & a Geo-Disc cartridge alignment platter. The box & contents are all in mint condition with beautiful unplayed vinyl. INCLUDED: The original shipping box and foam inserts from Mobile Fidelity, stamped R.C. on the sides. This Limited Edition Box was #0120 (out of however many were produced). This was originally purchased directly from (and shipped from) Mobile Fidelity Sound Labs in 1984. It has sat on display (and in storage) and never been played. This is the kind of find that audiophiles drool over--I hope that this finds a good loving home.